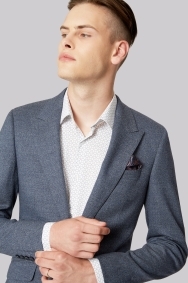 With a speckled texture, the pale blue colour of this jacket is perfect for brighter days all year round. 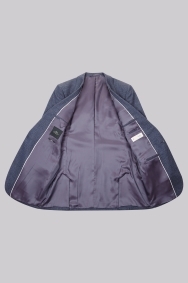 But if the temperature isn't up to par, the wool-rich fabric ensures you'll feel warm and comfortable anyway. 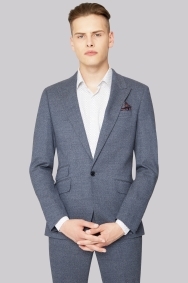 The skinny fit is slick and contemporary, helped by the slight stretch in the fabric, and a single button fastening and peak lapels complete the up to date fresh look. 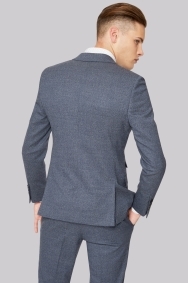 Combine the jacket with the matching trousers to create a smart suit that will set you apart from your peers. Keep your shirt and accessories simple to preserve the sense of modern style. Amazing jacket. Fits so well. First I bought one size up thinking that this is slim fit so I need size up but that was a mistake. I exchanged for my size and it's amazing. Great colour and quality. It’s good product to use.